Place chicken in 3 1/2- to 4-quart slow cooker. Top with onion, bay leaf, pepper and gravy. Place celery on gravy. About 30 minutes before serving, make and bake 8 biscuits using Bisquick mix and milk as directed on package. Meanwhile, gently stir frozen vegetables into chicken mixture. Increase heat setting to High. Cover and cook 15 minutes. Remove bay leaf. 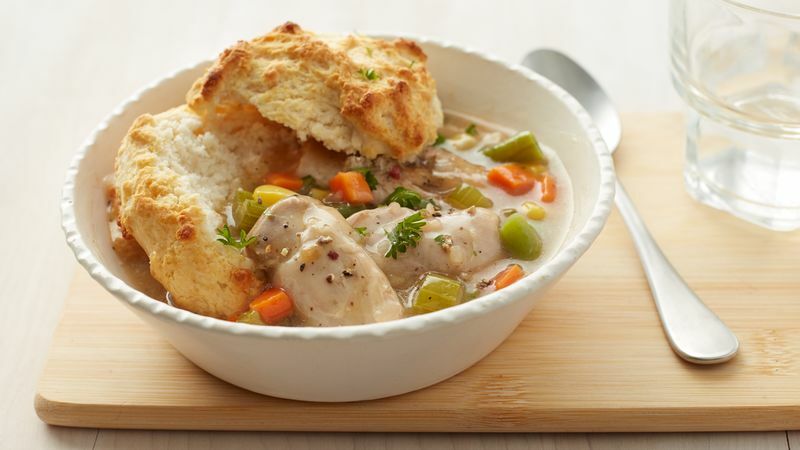 For each serving, split biscuit and place in soup bowl or tart pan. Spoon about 3/4 cup chicken mixture on top of biscuit. Note: This recipe was tested in slow cookers with heating elements in the side and bottom of the cooker, not in cookers that stand only on a heated base. For slow cookers with just a heated base, follow the manufacturer’s directions for layering ingredients and choosing a temperature. In a rush, enjoy this as a hearty stew without the biscuits. Stir 1/4 cup white wine into the chicken mixture, and bake frozen puff pastry shells in place of the biscuits for an elegant twist.